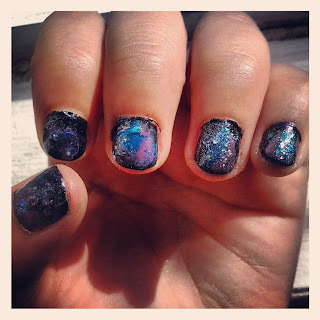 Today I'm going to show you guys how to do a galaxy inspired nail art mani. Don't be intimidated, I know it may look hard but it's actually pretty easy. If you have a decently steady hand it will be a breeze, and if not, practice makes perfect! I think that galaxy print is so hot right now. I've seen them on everything from bandeaus and leggings to phone cases. If you're not ready to go for the full on out-of-this-world look, this mani is the perfect way to test the waters. You can find the links to some of the above. Psst...they're each less than $10 online. Bueno, bonito y barrato! Step One: Paint nails with a base coat. I can't stress enough how important this is. If you don't, chica, I promise you your nails will stain and have a yellow tinge when you take the nail polish off later. We're going to be using some dark colors today so just dab a coat on and protect your nails! Step Two: Once the base coat is dry, paint your nails with a black or navy color. This will be the background for the cool nebula we're about to design. Step Three: Next, take your makeup sponge and draw a stripe down the middle with your blue nail polish. Step Six: Repeat the same process except paint a pink strip on the makeup sponge and dab that on wherever there is color missing. Step Seven: Add your glitter nail polish but don't press down too hard on the brush because you only want to get a couple of specks on there and not paint over the entire "nebula." It comes out looking more authentic when you have a second glitter nail polish in different sized/colored specks because it makes the galaxy blend in better. Step Eight: Finish with a clear top coat and voila, you now have the galaxy at your fingertips! What are your favorite nail art manis? Post pics below if you gave this tutorial a try, I'd love to see what everyone's results look like!